I heart you. And I want to go and see all these cool things you keep photographing, and get loads of decorating ideas from you. Awww! You'll just have to make that European trip then, won't you? I suppose so. :) I've sworn up and down that I'm going to visit my best friend next year, which'll at least have me on that side of the Atlantic. Or you could move your house here, you know. It's always an option. How people get all fancy with those things is beyond me! Actually, I hate tea. But I love your tea pot. Hoorah! I also hate tea! Although, I like green tea, if it's served next to a bottle of sake. That looks so comforting and cheerful right now. I love the cup and saucer with the bluebirds. Thanks! I got them (along with a little matching plate) in a market a few years ago - I think it's from the '40s or '50s. 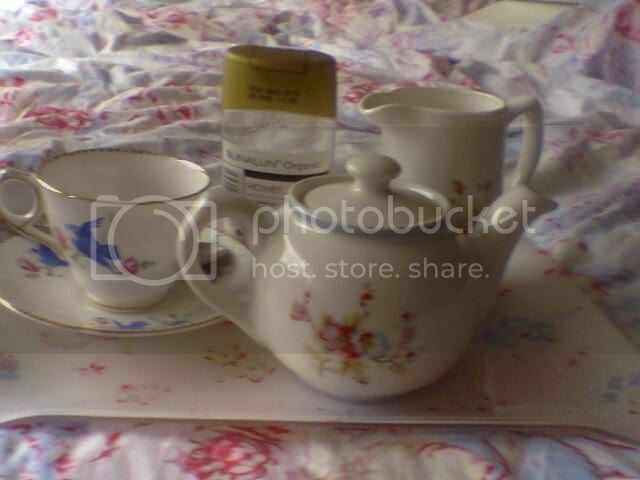 The rest of the crockery (and the tray, and the duvet cover) is by Cath Kidston. I love that you have pretty girly tea things on a tray, and not just a cup of tea and a bologna sandwhich or something equally dull. Now, you still need silver sugar tongs, and a crystal bud vase! Oh - so civilised. My father says tea only tastes right when drunk from a bone china cup. So I am sure he would approve. It actually does taste better, something I only really realised a few years ago. I never drank tea as a kid, and only really started drinking it towards the end of college (I know, the madness), so most of my tea drinking has been out of my own independent collection of crappy but cute mugs rather than my great-grandparents' wedding service. And then a few years ago my parents gave me a fine bone china cup and I realised the error of my mug-using ways. I do have a great Cath Kidston bone china mug, which is the perfect size for (a) a good large cup of tea and (b) small enough to keep the tea warm even with lots of milk. Right, now I'm off to get my first cup of the day! Hee, it's lovely organic honey in a sort of squeezy container! Which i started using instead of sugar in my tea a while ago. BTW, I am so sorry we won't be seeing you next week, but on the plus side, it means that we can hopefully come over once Patsington's thesis is finished and actually meet Miss Bassy Jr, the Infant Acrobat, in person! Please do come, it'd be ACE to see you! And, later on in the summer, I'll be mobile again and we can go to the beach and stuff. Please send me some good vibes on Thursday 12th!